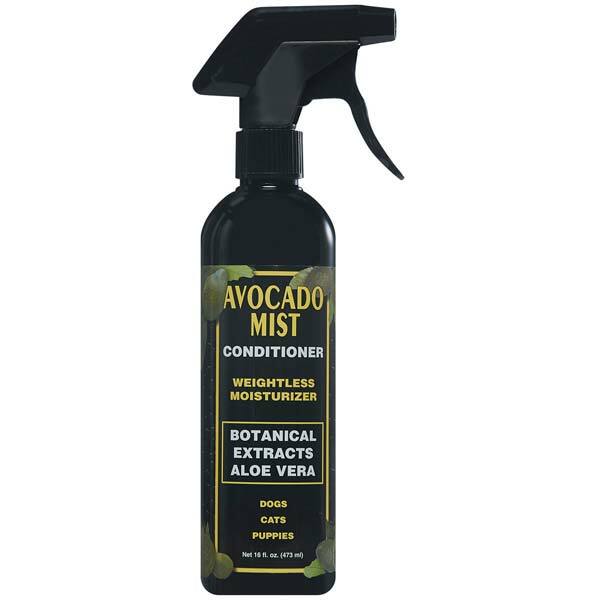 Excellent for long haired breeds, EQyss® Avocado Mist Conditioner Detangler is a botanical leave-in conditioning spray that maintains the moisture balance within the hair shaft, preventing the coat from becoming dry and damaged. Reduces shedding, enhances shine, and conditions/moisturizes the coat with a unique formula that combines extracts of Avocado and Aloe Vera. Detangles without adding weight to the hair Replenishes natural oils lost in shampooing Repels dust and dirt and won't burn eyes Anti-static, and silicone and alcohol free Can be used on wet or dry coats Leaves coats smelling great with a refreshing scent Safe for use on dogs and cats. Sizes: 16 oz.